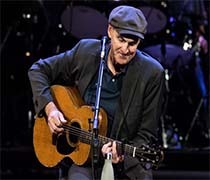 Legendary singer-songwriter James Taylor has announced a 12-show run in Las Vegas this spring at The Colosseum at Caesars Palace. Taylor will be joined by his All -Star Band for the limited engagement. Tickets for shows scheduled April 17 through May 11, 2019.